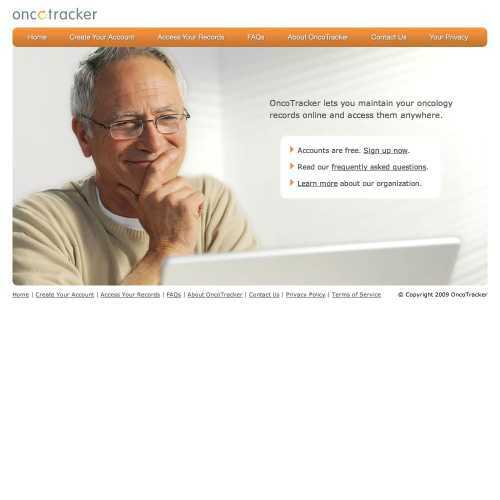 OncoTracker wanted to provide an easy way for oncology patients to access their medical records anywhere. I designed a solution that walks users through the process of entering their records step by step and allows them to track the progress of their treatment. OncoTracker approached me with their idea for a service to allow oncology patients to store their treatment records online. 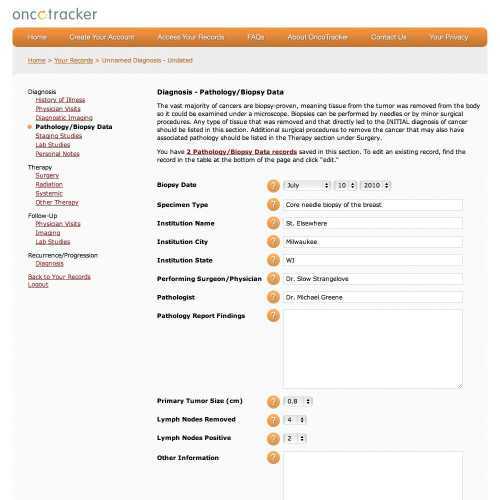 Cancer patients, already burdened with their illness, carry the stress of transporting extensive medical records from physician to physician over the course of lengthy treatment cycles. 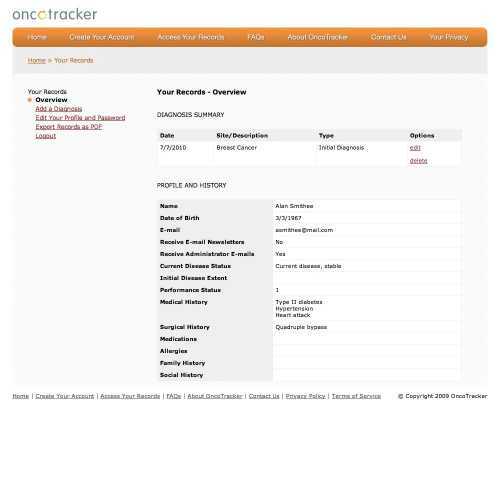 If they could store their records online, any doctor or family member with the appropriate credentials could login and view the patient's medical history, relieving them of this additional burden. 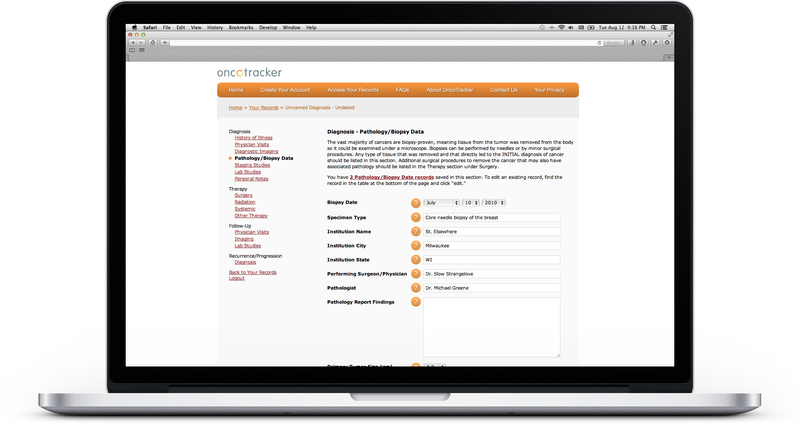 OncoTracker wanted a web site that would walk users through the process of entering their medical records and allow them to export those records when necessary. With this set of fairly open requirements and a very aggressive timeline, I got to work. 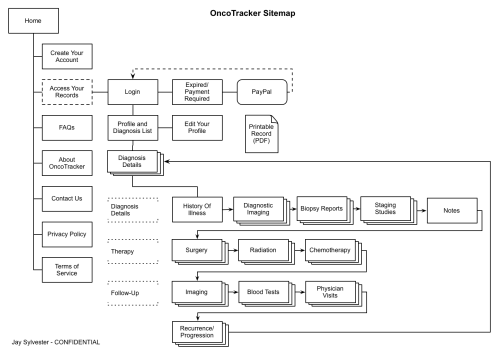 The first step was coming up with a logical, friendly architecture that would guide users through the process of inputting lengthy treatment records that potentially span multiple treatment cycles from a series of physicians. 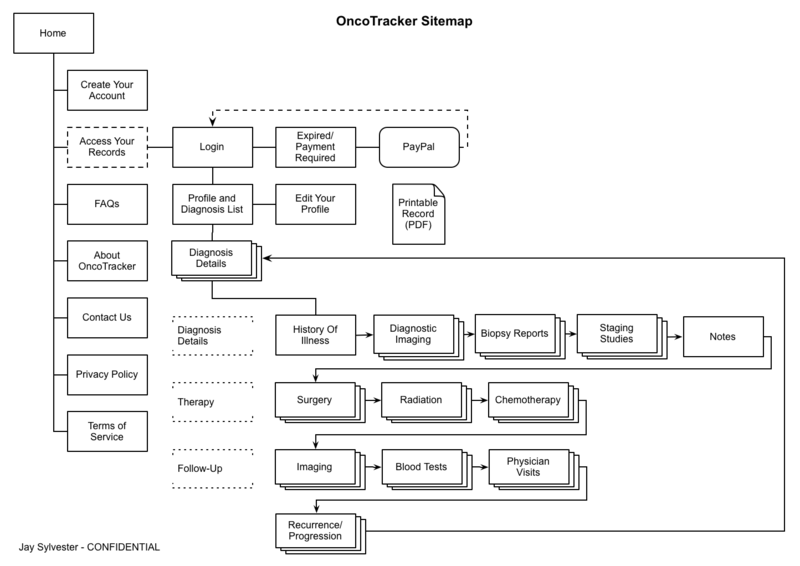 Working with OncoTracker to understand the many stages of cancer treatment, I put together a site map and HTML wireframes to demonstrate how I planned to get the user from one step to the next. I broke the process down into 3 primary stages based on chronological progression: diagnosis, treatment, and follow-up. Each stage would have multiple steps for entering specific details about that stage. Within each step, the user would be presented with a detailed description of that step's information and a form to capture their data. 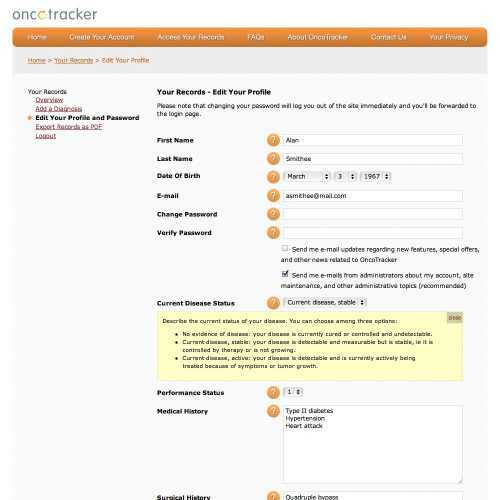 Each form field also would have its own accompanying help text to assist the user in translating cryptic medical data from their paper forms into the OncoTracker interface. Because entering such large amounts of data can be a time-consuming process, the user would be able to stop at any time, save their progress, and pick up where they left off later. Users also would be free to jump from step to step, skipping any step along the way that didn't apply to their treatment records. 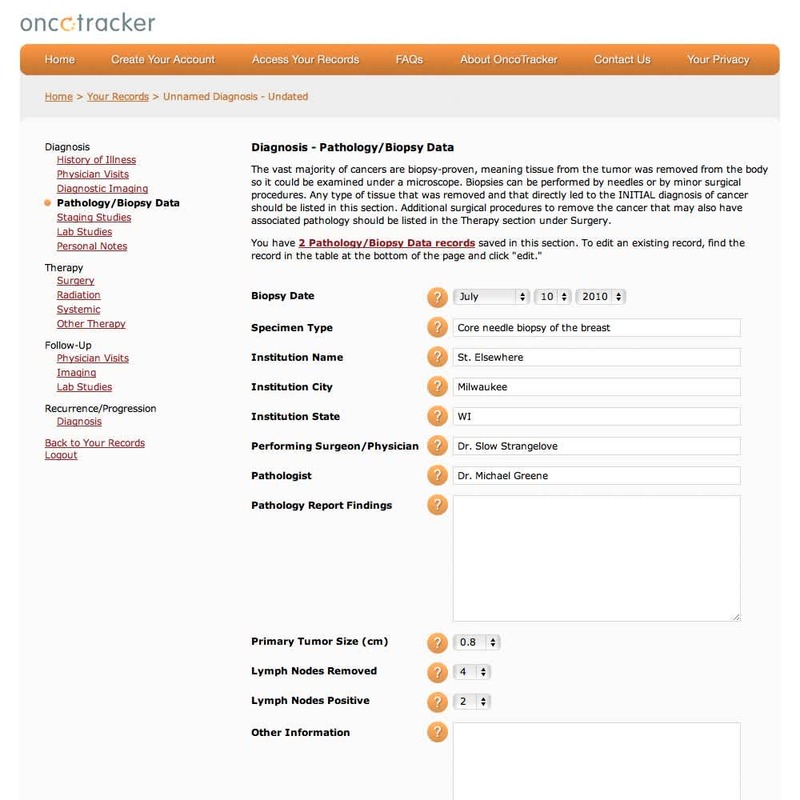 Each step in a particular treatment cycle would present the number of records stored for that step and allow the user to edit those records or create additional records. 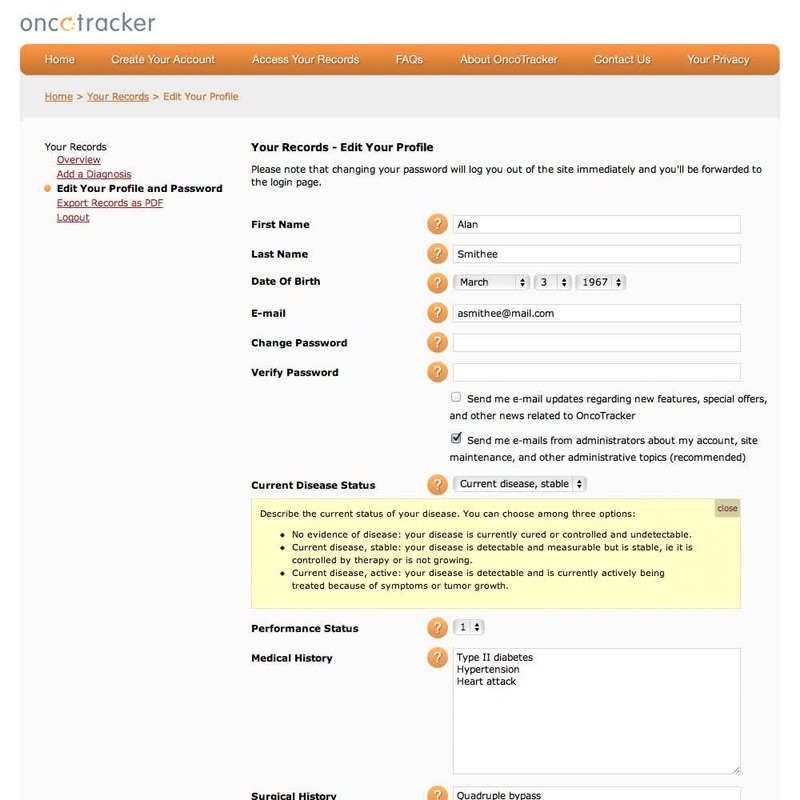 The final product was an easy-to-use interface that allowed oncology patients with a lot on their minds to spend less time worrying about their medical records and more time focusing on their health. "In my day, we didn't have these fancy debuggers and linters and build tools and repos. We coded sites by hand in Notepad directly on production via FTP with no backups at 3 AM on a Thursday before the busiest shopping day of the year. That's the way it was, and we liked it!" Copyright © 2018 Jason Sylvester. All rights reserved. Source available on GitHub.